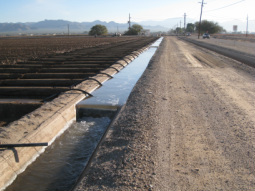 Cortaro Water Users’ Association is a non-profit private corporation with a public purpose providing irrigated water to landowners within the district boundaries, which cover over 12,000 acres in Cortaro Farms and Marana area. Agricultural land uses 98 % of the CMID water. All landowners within the district are subject to assessment. The remaining 2% of water use is comprised of environmental waters, golf course irrigation, sports park irrigation and construction water. This region has long been known for its rich agricultural heritage. Long before the Spanish Conquistadors and missionaries arrived in the 1600s, Hohokam Indians inhabited the Marana/Avra Valley region and developed extensive canal systems to use the waters from the Santa Cruz River for irrigated agriculture. The Cortaro-Marana Irrigation District has a long history, tracing its roots back to 1918, when drilling began on the first well in the region. In the aftermath of World War I, Edwin R. Post, an immigrant from Michigan, promoted an irrigated farming expansion in the area, which included drilling wells in the desert, installing a pumping plant and constructing an extensive irrigation system to bring surface and ground water to fertile desert land. This expansion project brought many new families to the area to grow cotton and created renewed interest in farming in the area. In 1946, the Cortaro Water Users’ Association (CWUA) was formed to manage the water supply and delivery system for area landowners and secured a certificate of water right to withdraw waters from the Santa Cruz River and its tributaries for beneficial uses within the CWUA’s boundaries. In 1961, the CWUA transferred all its rights to water, including its rights under the certificate of water rights, to the Cortaro-Marana Irrigation District (CMID). The CWUA continues to act as an agent and operating company for CMID. In 1977, the district played a key role in the incorporation of the Town of Marana, in part to preserve the rich agricultural history of the region and protect the water tables that provide water to the entire area. In 1980, Arizona adopted the Groundwater Management Act (GMA) and created the Arizona Department of Water Resources to regulate the use of groundwater in each designated active management area within the state. The state legislature also established classes of water rights based on historical groundwater usage, including Irrigation Grandfathered Rights (IGR), Type 1 Rights (non-irrigation rights based on IGRs), Type 2 Rights (non-irrigation rights with no IGR basis) and Service Area Rights (for cities, towns, private water companies and irrigation districts). CMID uses its facilities to deliver irrigation and non-potable water to landowners within its service area.